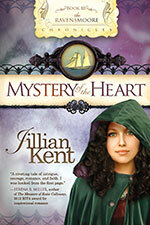 Mystery of the Heart is the third novel in my Ravensmoore Chronicals series. You can read more and order your copy on my Books page. Treat yourself to the entire first chapter in order to decide if it’s your cup of tea. You may want to read the first chapters of books I and II in the series, Secrets of the Heart and Chameleon if you haven’t read them yet. Although you can read any of these books as stand alone novels I encourage you to start with the first one. I hope you will take a few moments to explore and enjoy these first chapters and if they tweak your interest click on the store sites that will zip you on over to your favorite buying spots. If you visit your public library please consider asking them to order this series. This book series launched the fulfillment of a great dream, one I’ve prayed for and worked towards for many years. My message to all who enter here is, “DON’T GIVE UP YOUR DREAMS.” I’m a firm believer that God will make a way in His time, but He expects us to do our part. If you quit, you’ll never know what could have been and if you stay the course you’ll know you are actively participating in the life you want and the dreams you hope to fulfill. If you’d like to find out more about my writing journey, click the Meet Jill tab. If you’re a writer, check out my Writing Tips page, where I include sites that will help you hone your writing craft, great books on how to improve your writing, a list of conferences, and links to some of my favorite authors. Visit my News & Events page to see photos from recent events, find information on my upcoming appearances, and sign up to receive news on my new series, the Ravensmoore Chronicles. Stop by my Blog if you get a chance and please join my mailing list! I’ll be sending out 3-4 newsletters each year. I’d love to connect with you, as I explore this crazy writing life, favorite books and movies, and other areas of interest I think you might enjoy. We can also connect through my Contact page, where you can send me an e-mail with a mere click.